Developer KOEI TECMO GAMES CO., LTD. Abandon all fear. Attack on Titan 2 is the gripping sequel to the action game based on the worldwide hit anime series "Attack on Titan." Experience the immense story of the anime alongside Eren and his companions, as they fight to save humanity from the threat of the deadly human devouring Titans. Try your hand in operating the omni-directional mobility gear, maneuvering and flying through the sky to counter the Titans, and feel the thrill and satisfaction of battling giant opponents. Based on the manga "Shingeki no Kyojin" by Hajime Isayama originally serialized in the monthly BESSATSU SHONEN magazine published by Kodansha Ltd. ©Hajime Isayama,Kodansha/"ATTACK ON TITAN"Production Committee. All Rights Reserved. ©2018 KOEI TECMO GAMES CO., LTD. All Rights Reserved. Pre-order and receive these bonuses: ・Christa, Ymir, Reiner & Bertholdt "Plain clothes" Outfit Early Release Abandon all fear. Attack on Titan 2 is the gripping sequel to the action game based on the worldwide hit anime series "Attack on Titan." 【Early Purchase Bonus】 ・Eren, Levi, Mikasa & Armin "Plain clothes" Outfit Early Release 【Deluxe Edition Contents】 ・"Attack on Titan 2" Game ・20 piece additional outfit set ©HK/AOT©KOEI TECMO GAMES CO., LTD.
Pre-order and receive these bonuses: ・Christa & Ymir "Plain clothes" Outfit Early Release ・Reiner & Bertholdt "Plain clothes" Outfit Early Release Abandon all fear. 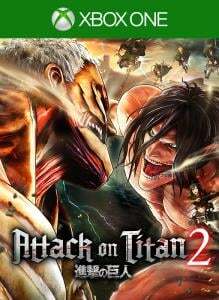 Attack on Titan 2 is the gripping sequel to the action game based on the worldwide hit anime series "Attack on Titan." 【Early Purchase Bonus】 Purchase before April 16 to get below DLC. ・Eren & Levi "Plain clothes" Outfit Early Release ・Mikasa & Armin "Plain clothes" Outfit Early Release ©HK/AOT©KOEI TECMO GAMES CO., LTD. Abandon all fear. 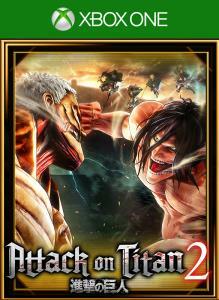 Attack on Titan 2 is the gripping sequel to the action game based on the worldwide hit anime series "Attack on Titan." 【Early Purchase Bonus】 Purchase before April 16 to get below DLC. ・Eren, Levi, Mikasa & Armin "Plain clothes" Outfit Early Release 【Deluxe Edition Contents】 ・"Attack on Titan 2" Game ・20 piece additional outfit set *Additional outfits included with this set can also be purchased separately. Be careful to avoid making a redundant purchase. 【Deluxe Edition Contents】 ・"Attack on Titan 2" Game ・20 piece additional outfit set *Additional outfits included with this set can also be purchased separately. Be careful to avoid making a redundant purchase. *After purchasing this content and receiving your additional outfits, you cannot cancel your purchase, regardless of whether you have downloaded the relevant items. 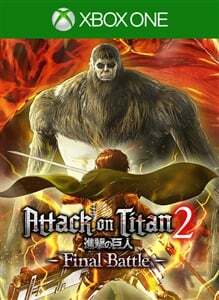 "Attack on Titan 2: Final Battle Upgrade Pack" contains the latest content for the tactical hunting action series based on the hit anime series "Attack on Titan". ■Includes the stories from seasons 1~3 of the anime! ■More than 40 playable characters join the battle! ■Experience the thrilling action of "ODM Gear"! ■New equipment "Thunder Spear" and "Anti-personnel Omni-directional Mobility Gear" have been added! ■The new mode "Territory Recovery Mode" has been added!